VW bus nuts–this one’s for you! I’ve been meaning to post this VW Bus printable for a while. I used this freezer paper stencil to make pillowcases for my son last spring. If you haven’t discovered freezer paper stencils for creating crisp, silkscreen-like images on fabric, here’s the complete how-to. For impatient, lazy sorts (like me), they offer immediate craft gratification. Craftification. I think this would make a groovy T-shirt, too. Tape the stencil directly to freezer paper. Cut out the gray areas–these will become the painted areas. Along the dotted lines, trim a sliver from the freezer paper–this will create a line of color to outline the white parts of the image. Please share your results! Great post! It’s really great to see the stencil for this image–the outline is brilliant! I’m scared to do this. Many confident crafters have recommended this technique. I really need to screw up my courage and give freezer paper stenciling a go in 2012. 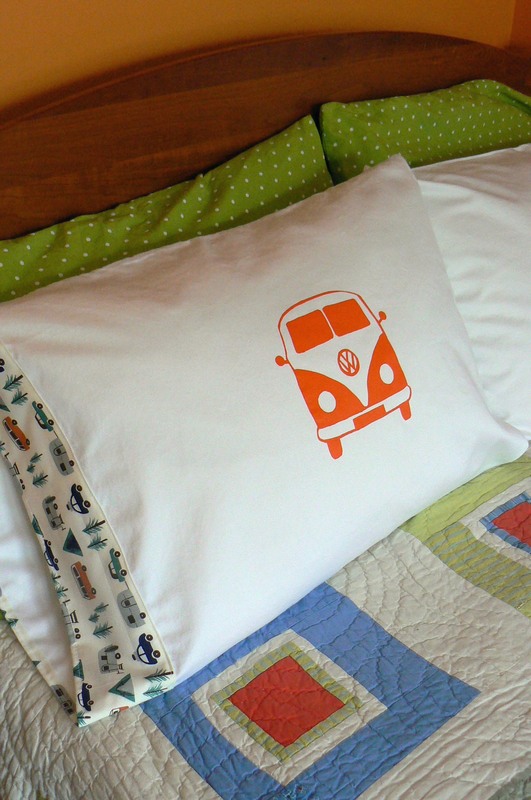 Your adorable vw bus print is certainly incentive! Thanks for sharing. Don’t be scared! It really is easy. Maybe give it a try on some scrap fabric first to build up your confidence. Go for it and send us pix of your creations. We’d love to see! Love this! I’m also looking for an image for a teepee. Any suggestions? I’m trying to cut out your wonderful VW bus stencil and I can’t figure out how to cut the head lights and the VW sign? Sorry I missed this earlier! To create the head lights, cut white circles from the freezer paper. I used an X-acto to cut out the VW sign–the little white bits that are left after you trim away the gray part of the stencil will need to be placed onto your fabric. T(hese shapes will become the white/negative part of your print.) Instead of trying to iron the little pieces into place, which can be super hard, warm your fabric with the iron and stick the bits on with your fingers. I hope this helps! Freezer paper is what folks used to wrap meat in when freezing. It’s white and coated on one side. You usually can buy a roll of it at the grocery store! 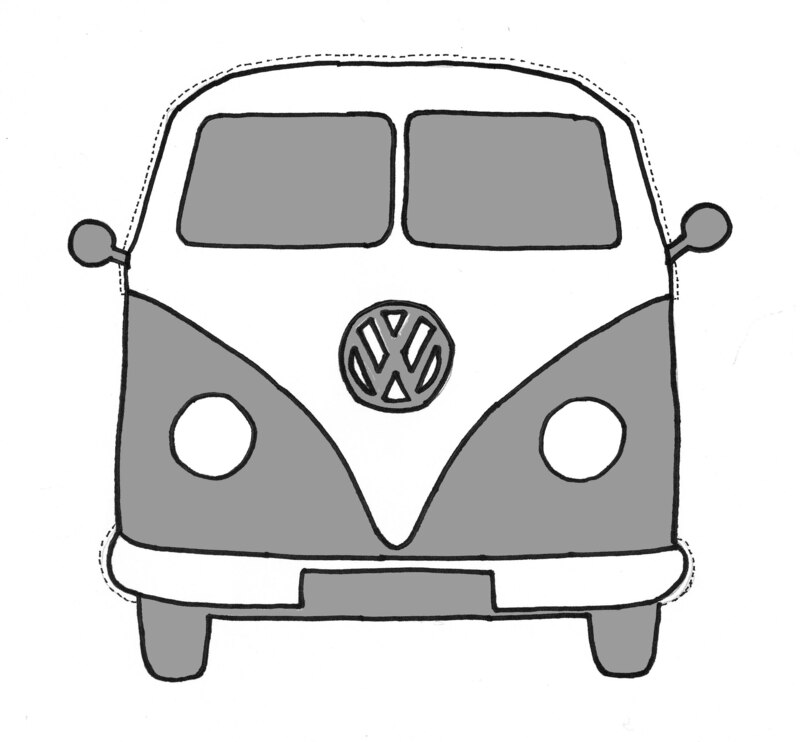 Hiya, I am trying to download your VW stencil…..how do I do it please?